Serve our Mini Shrimp Cocktail Bites as an appetizer at your next dinner party. Guests will enjoy trying one (or two!) of these shrimp cocktail bites. 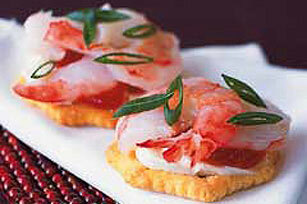 Frozen shrimp can also be used to prepare these appetizers. To thaw the shrimp, place the bag of frozen shrimp in the refrigerator and let stand until thawed. Or, place the sealed bag of shrimp in a bowl of cold water and let stand until thawed, changing the water every 10 minutes. Never thaw the shrimp on the countertop.